Throw away everything you know about conventional dry wax food service sheets and get ready to be impressed with the awesome branding power of Golden Rod Paper! This lightweight food service sheet is great to use as food wraps and basket liners. If you are looking to take your branded message to the next level, then look no further than our custom printed GoldenRod Paper! Unique solid yellow base color! This unique food service sheet will have your printed brand seeing gold! What do you mean by short-run? Simple… our minimum order requirement for custom printed Golden Rod paper is 1 case = 5,000 sheets, OR 5 rolls = 5,000 feet (1,000 feet per roll). Our ability to deliver short run orders of custom printed Golden Rod paper will reduce your storage space needs, and allow you better control of your product inventory. How long will my goldenrod order take? 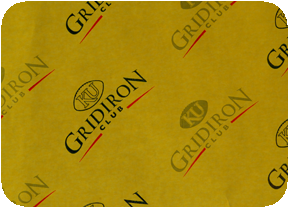 Lead time for our custom printed Golden Rod paper is 6-8 weeks. If you need your order sooner, contact one of our sales staff immediately. What are your standard golden rod sheet sizes? 6 x 10.75, 8 x 10.75, 10 x 10.75, 12 x 10.75, 12 x 12, 15 x 10.75, 15 x 15. Larger sheet and roll sizes are available for some paper types. What kind of artwork is required for Golden Rod Paper? All artwork submitted must be a Vector art file. Adobe Illustrator, .EPS and high resolution PDF files are preferred. If the line artwork is simple enough, sometimes a JPEG file will work. Bitmap images are not good enough quality for proof or plate making, and are not accepted. 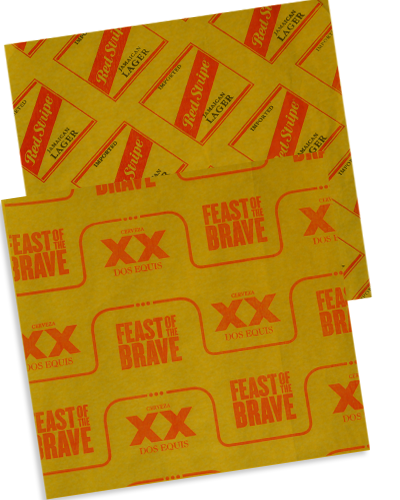 Is four-color process printing available for food wraps and basket liners? We are currently limited to 2 spot PMS colors on all of our short run food service sheets. We do have the ability to add 1 or 2 screens to your print if the colors in your logo allow us to use them. Three and four color prints are available for most of our food service paper line, however, minimum order size and print capabilities vary. Contact our sales staff for more information. Need a price quote on custom printed Golden Rod Paper? Contact us today! Our industry exclusive 1 ply coated cheese paper is sure to impress your customers and keep them coming back for more.